This attractive radio is a typical Plant A product with a generic name tag slapped on it. 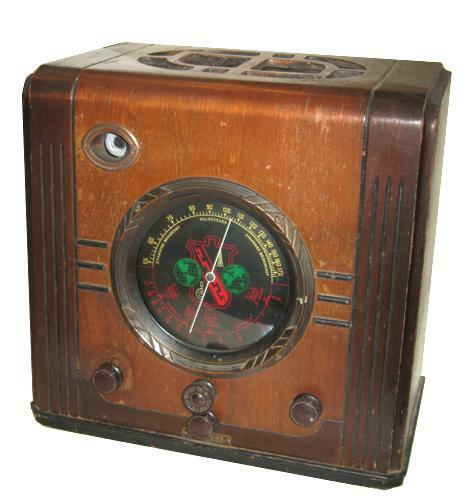 I bought the radio from a local auction because I found its style appealing and similar to the Zenith cube radios. Little did I know I was bidding on a Plant A radio until I brought it home and immediately noticed the telltale black and orange manufacturer tag on the chassis. Plant A radios are infamous for lack of technical information because schematics were often not submitted to Riders and generic names have no obvious correlation to a specific manufacturer and model. On top of that, this radio appeared to be modified at one point in time; the 25Z5 rectifier was replaced with a 117Z6 using a socket adapter and I found later that the ballast tube used to drop the remaining AC voltage for the tube filaments excluding the 25Z5 was called an "Adjustable Ballast Type B" that was configured to drop 75 volts rather than 55 to roughly compensate for the 25V drop of the 25Z5 tube that was taken out of the filament circuit. The 117Z6 is convenient as a rectifier for battery sets because its filament alone can handle the full AC voltage. The rest of the radio was fairly unmolested and easy to repair without a schematic. Plant A radios often have a schematic glued on the inside or at the bottom of the cabinet as was in my case, albeit difficult to read. Clinton manufacturered several Plant A radios, but I do not know if they made this one.